So, I did it, I signed myself up for the Avon Walk. This is a fundraising event that involves walking 39.3 miles over two days. The first day you walk a marathon, and the second day you walk a half marathon. The walk takes place through the city streets – in my case, it will be through the streets of San Francisco. As this is a fundraising walk, I need your help. In order to participate I need to raise at least $1800. So, I’m asking for your help. My fundraising page is: http://info.avonfoundation.org/goto/rjhogue. I may seem like a cliche statement, but every little bit helps. I really debated signing up for the walk. I don’t generally like these large fundraiser event type things – but I was motivated by several things. First, one of the ladies in one of my support groups spoke very highly of it. She said she found a lot of encouragement in the crowds that gathered to cheer them on. It as an emotional but very uplifting experience, and that takes on a whole new meaning when you are walking as a warrior/survivor. I looked into where the money went. I’m lucky to be located near Stanford, a center for excellence in breast cancer treatment. It is where a lot of the clinical trials happen. It is one of the few universities in the US that set the standards of treatment for the rest of the country. But I’ve also been lucky to be near Bay Area Women’s Cancer Connections (BCC), an organization that has provided me with a lot of support. There are lots of free resources that have been made available to me. I’m also very aware of a lot of women who are cancer poor. Women who have to make treatment decision based upon their finances. And I don’t even see the women who don’t get screening done or who have very limited access to healthcare. It is a real problem here – and so events like the Avon Walk providing funding for research, they also provide resources for women who could not otherwise afford them. The final reason I decided to do it (other than the cool opportunity to see San Francisco) was the timing of the walk itself. I’ve started to look beyond treatment – I’m making the move to look ahead in my life. The walk will come at a time when I should have completed the major treatment phases of breast cancer (chemo and surgery). There is some hope that after surgery I get declared “NED” (no evidence of disease). The treatment doesn’t stop there, as I’ll be on hormone blocking medications for 10-years – but I should be disease free. As such, the walk will mark a transition – from warrior to survivor – and that is something significant and should be celebrated. As I write this, it is day three of my third chemo cycle. I had a great visit with a friend today which did a good job of distracting me from how awful I feel on day 3. Last cycle I also felt awful on day 4, so I have a reiki appointment which will hopefully fill me with healing energy and get me through this cycle. I’m truly hoping that the cumulative effect doesn’t mean I feel awful on day 5! 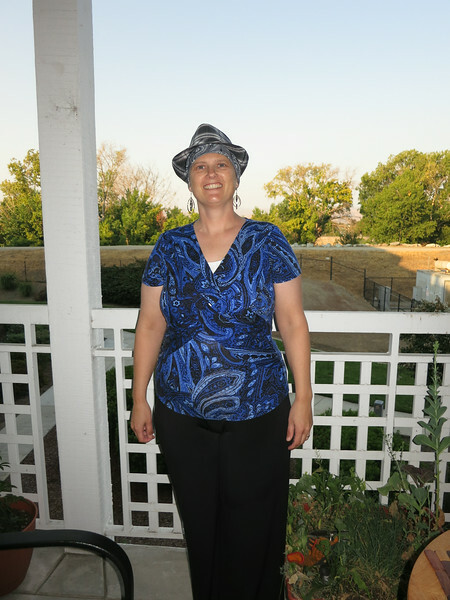 Only one more cycle of AC to go (yay) – and my oncologist promises that T will be better! Going out today gave me an excuse to dress up and try out the stylin’ new hat and earrings my mom sent! I am amused at how much I like to dress up when I go out now – that is so not like the old me. We are going camping on Saturday night. We have not been camping yet this summer – which is so unlike us. Having a temporary disability permit has been a life saver for me. It has meant that I can run errands even when my energy is low, but it also means we can go camping this weekend. The California State parks set aside certain sites that can only be used by someone with a placard. So even if all the other sites are full, no one else is permitted to use them. This meant that when I was looking for a site on Monday, there was one still available for Saturday. It is a real savior to be able to go camping at the last minute, as there was no way we could have planned in advance how I would be feeling. Honestly, I’m not 100% certain I’ll actually be up for it – but I figure, if nothing else I can spend an afternoon reading a book in my camp chair surrounded by ancient trees – sounds pretty peaceful to me! We stayed at a park in BC (Manning I think) that had a campsite share system where you could post in front of your site if there was extra room. Tenting, we never used up the whole site and it was fun to have different guests spend the night. With reservations this might be harder to arrange but the placard system at least assures you a site after a long drive and the sharing thing could become a drag when you are tired. Another thing in California that might still be in place are forest service cabin leases. We used to go to Haskel Creek up from Sierra City on Hwy 49. A neighbor owned a simple cabin and everyone on our street would rent a few weeks in the summer from them. Very relaxing place.